As a child, Diana López (B.A. ’90) loved to immerse herself in the world of books. But she noticed early on that the characters in the books didn’t look like her or share her last name. “I remember always feeling like there were two worlds. There was my world, and there was the world of books. I loved both worlds, but they did not overlap,” López said. Fast forward to college. She came to St. Mary’s University to study English where she flourished and devoured books. “That question was always spinning in my head,” she said. Still, López did not think of herself as a writer until she earned a Master of Fine Arts in Creative Writing from then-Southwest Texas State University in San Marcos and wrote her first book for adults as part of her thesis. After graduating, López started to write another adult book, but found herself frustrated and uninspired. While teaching a Writers in Communities literacy program for middle schoolers, López began thinking it was time for her to write for a new audience — young readers. I thought, just for fun, I wonder if I can write a story. I haven’t looked back. At this point, I have six middle-grade books, and I know I have more in me. 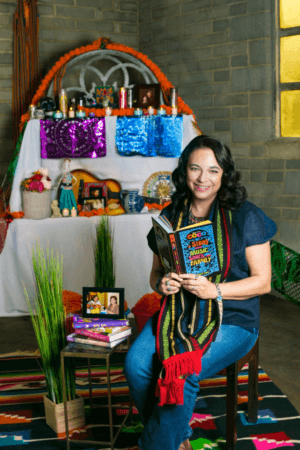 López draws inspiration from her world when showcasing her Mexican-American culture in her books. Her second middle-grade book, Choke, takes place in the San Antonio junior high where she once taught and mentions familiar San Antonio street names and places. López was on the faculty of the University of Houston – Victoria, teaching undergraduate creative writing, when she received an incredible opportunity. Disney/Pixar was looking for an author to write a young readers book adaptation of the 2018 film Coco. López’s name came up thanks to her work presenting Mexican-American culture in children’s books and a coincidental connection with the book’s future editor, who was introduced to López’s work while studying children’s literature in college. The film Coco is the story of a boy who dreams of being a musician and finds himself in the land of the dead on Día de los Muertos. The book project challenged López to combine what she knew about Mexican-American culture with the changing movie production concepts. When she’s not teaching or writing, López, who lives in Corpus Christi, travels across the U.S. sharing her love for books. Active in the Latinx writers’ community, she also advocates for diverse literature in schools, including books that reflect students’ varied experiences.